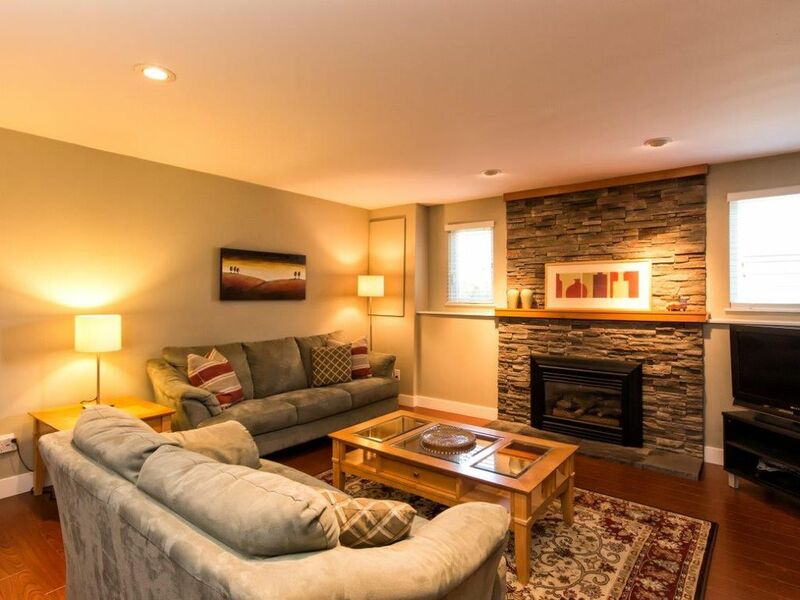 This nearly 1,000 sq ft, tastefully decorated 2BR ground level suite is ideally located and perfect for families, business travellers, mountain bikers and nature lovers! The suite is just 1 km from some of North Vancouver’s best parks and hiking/biking trails (Lynn Canyon/Lynn Headwaters/Lower Seymour Conservation Area/Baden Powell Trail). Just a few blocks away, in Lynn Valley Town Centre, you’ll find shopping, restaurants, a wonderful library, pub, cafe and more. Downtown Vancouver, Grouse Mountain, Lonsdale Quay, the PNE and the Horseshoe Bay Ferry Terminal are all just minutes away by car and are also easily accessible by transit with a bus stop just half a block from your door. • Well-designed, fully-equipped maple kitchen with pass-through to dining room/living room (also serves as breakfast bar), glass tile backsplash, dishwasher, OTR microwave, smooth-top range, full-size, built-in refrigerator, garburator, tons of counter and cupboard space, under-cabinet list goes on. This kitchen is a joy to make meals in! PLEASE NOTE THAT SINCE VRBO WAS PURCHASED BY EXPEDIA, THE RATES SHOWN BEFORE YOU BOOK ARE IN USD DOLLARS. YOUR RATE IS CONVERTED TO CANADIAN DOLLARS WHEN YOU CLICK THE "BOOK" BUTTON. YOU WILL BE ABLE TO SEE THE ACTUAL CANADIAN DOLLAR RATE BEFORE YOU ACTUALLY SUBMIT YOUR RESERVATION. Under tile-floor heating, granite countertop, chrome fixtures, extractor fan, bathtub, shower. Shampoo, soap & conditioner provided. Washer & dryer in the suite. Super easy to use, very reliable. Lovely gas fireplace - operated by remote controller. We provide locally roasted rich but smooth coffee beans, coffee grinder and easy-to-use French Press as well as a programmable drip coffee machine. Plenty of plates, bowls, mugs & glasses to suit all your needs. And tons of cooking utensils, from corkscrew, to measuring spoons, from oyster opener to BBQ tongs. You name it - you'll find it!! Fully equipped kitchen. Calling this 'home from home' - guests have found everything they need. But if you can't find something in one of the many drawers and cupboards, we're happy to provide it! Black wooden dining table which comfortably seats 6 - with 2 leaves to insert for extra length. 6 padded chairs. Over the years guests have left & exchanged books to provide a nice little collection for your use. If you can't finish it by the time you leave - feel free to take it with you or leave one behind! Quiet & private back garden with raised vegetable beds for you to pick fresh herbs & vegetables (when in season) + your own 'Terrazza' with patio table, chairs, umbrella and 2 sun loungers. Your very own 'Terrazza' with patio table, chairs, umbrella and 2 sun loungers. Charlie was very helpful with restaurant suggestions and the property was a perfect location for all the various attractions, hikes and cities we wanted to see during our stay. It was great to have you stay in our suite. Sorry we couldn't stop the rain for you!! You're welcome back anytime! We really enjoyed our stay. We arrived on a rainy and windy afternoon, after a walk to Capilano Suspension Bridge. The apartment was so clean and cozy! The fireplace was on, the bathroom floor was heated, even a tea kettle was waiting for us on the stove. Charlie also left all the necessary ingredients for a nice breakfast. Thank you for your hospitality! A tastefully decorated, well equipped and spacious property. Fantastic accommodation and lovely owners who make every effort to help you enjoy your stay. Welcome pack with eggs, milk, bread etc was thoughtful and generous. The unit was absolutely perfect. Would stay there against n.
Terrific place to relax after busy days hiking in Lynn Canyon, Whistler and seeing city sights in Vancouver. We SO appreciated the fresh organic eggs, bread, fruit, coffee and juice supplied by our host. The kitchen is extremely well supplied and we enjoyed the cozy fireplace to take the chill off. Easy to get to the Seabus and Canada Skytrain & buses to explore downtown Vancouver, Stanley Park and UBC campus without the hassle of parking. Excellent value! Thanks so much for the great review, it was a pleasure having you stay in our suite. And thank you for leaving the place in such immaculate shape - very much appreciated. We look forward to having you back the next time you visit North Van. Wishing you both a Happy Canadian Thanksgiving!